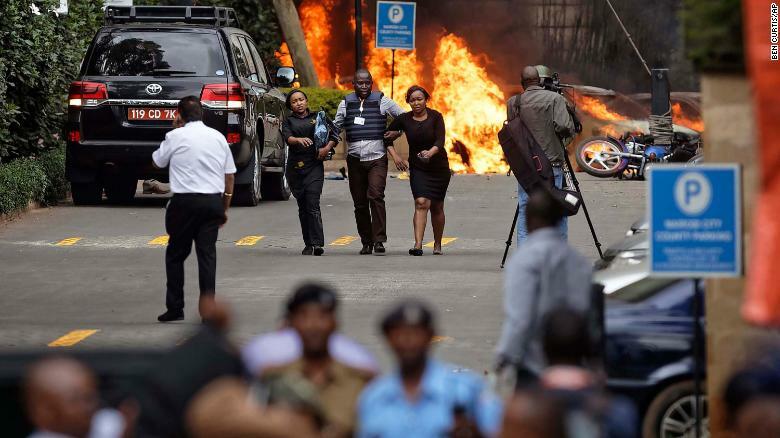 Kenyan security forces have secured the buildings in Nairobi where gunmen mounted a deadly attack today, a government official said. At least 11 people have been killed during what police described as a "suspected terror attack" at the complex in the Kenyan capital. Heavy gunfire and an explosion sent people running for their lives today at the compound in an affluent neighborhood. Footage from the scene showed armed officers escorting office workers and injured people to safety as the sound of shots rang out. Cars in the compound could be seen aflame as a helicopter flew overhead. The Somali Islamist militant group Al-Shabaab has claimed responsibility for the attack, according to SITE Intelligence Group.